You are here: Home / Books / How Much Money Do I Need to Retire Review? Today I want to share a review (and giveaway!) for readers looking to retire smart. 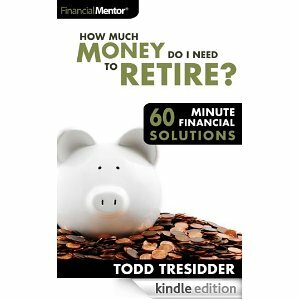 Todd Tressider, from Financial Mentor, has a wonderful book out. While the book is certainly a manageable size, there is a lot of information packed into the pages. Tresidder walks through how you can get an idea of what you need to have saved so your money doesn’t run out while you’re retired. The kindle edition is $4.99, which is a steal, considering how much is covered in the book. The book is broken up into main sections, based on different models that can be used to plan for retirement. The first section addressed is the conventional model, where financial advisers and calculators taken certain inputs and gives you a number or a range to shoot for. How much income do I need for retirement? How does inflation impact the amount of money I need for retirement? How does life expectancy impact the mount of money I need to retire? How much will my company pension and social security pay during retirement? How much investment income can I expect during retirement? How does the order of returns and market valuation affect your investment return assumption? What I appreciate is that Todd pulls no punches with these questions and more. He shares the math and studies relevant to each question. You are encourage to run the numbers yourself and decide whether or not conventional retirement planning suits your needs. From here, the second section covers creative retirement planning. Todd goes over how you can adjust and tweak your current lifestyle and assumptions based on scenario analysis. He gives some practical advice on how you can turn activities and hobbies that you enjoy into income streams that you can utilize when you retire. For couples approaching their retirement and are looking to shore up their finances, this section is for you. The last section gives the cash flow model, which Todd used himself and allowed him to ‘retire’ (be financially independent) at 35. He crafted a three rule system handles inflation and life expectancy plus gives you diversified sources of income. I met Mr. Tresidder last week in St. Louis and I attended one of his sessions. Not only is he extremely knowledgeable about investing, he is also a genuinely concerned about helping others get their retirement plan squared away. He was kind enough to offer a couple pf autographed copies of his book and I’m giving them away on both my sites – one for a Couple Money and one for My Financial Reviews. There are several ways you can submit it:It’s simple to enter; I just want you to share your biggest retirement question by November 30, 2013. I’ll pick a winner December 1, 2013. Facebook: Go to My Financial Reviews’ page and leave it as a comment. Twitter: Tweet it out to me (@MyMoneyReviews). Once you do, just leave a comment below so I can record your entry.